Why Explore the Mind-Body Connection? The mind-body connection helps us answer the question: “Which do I change when I want something different? The mind, or the body? It is a lifetime’s work to understand our own mind-body connection so that we can better control our health, emotions and habits. We call upon doctors, physical trainers, nutritionists, yoga instructors, philosophers, novelists, and ministers to help us understand ourselves. 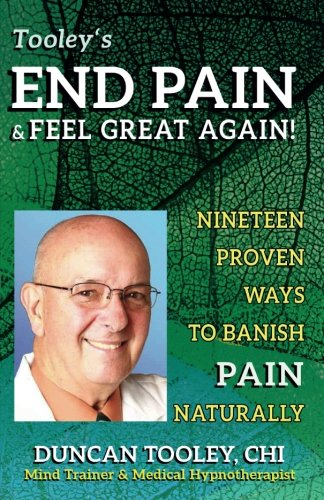 Sometimes we add therapists, specialists, and coaches. We all have something that we want to change at one time or another. An understanding of how we function is essential to effect any change. What follows is a mind-body connection model that underlies all the tools, training, and assistance that I provide. Philosophers have speculated for centuries about the mind and consciousness. The mysteries about how the mind works are gradually being unraveled. Scientists are learning more each year, especially now that they can monitor brain activity in real time with functional magnetic resonance (fMRI) scanners. Your brain is NOT your mind. Your brain is the housing for the activity of your mind just as the radio circuitry is the housing for the reception of radio signals coming through the air. There is still much theory and speculation about how the brain works, especially how it results in consciousness, the mind. With billions of neurons in the body and hundreds of billions of neural connections, we have a very long way to go in sorting out the complete mind-body connection. Below is a model that helps us understand not only how our mind and body work together, but also how to make improvement changes to get what we desire. The engineers who designed computers were very shrewd. In order to make our interface to technology easier, the computer engineers designed computers to be very much like our mind-body connection. Computers are rapidly changing as they continue to shrink, so some of the initial design elements are becoming more hidden. When you look at a desktop computer the first thing that you see is the hardware: the screen, keyboard, mouse, printer, and speakers. These are all devices to get the information into or out of the computer. Each of these devices (called peripherals) is connected to the central processing unit, or CPU, with electrical cables. You know that the computer hardware, essential as it is, is lifeless without the software that makes the computer really able to accomplish work. The basic unit of software is the program. A program is a fixed set of instructions that produces the same result for the same input and trigger every time it is run. Some programs are simple and can only handle one type of input, for example a calculator program can only add, subtract, multiply or divide. Others are more complex and can handle a variety of functions, like a fully-featured spreadsheet that can accept formulas and cross-column calculations. The key principle of a program is that for the same input and trigger (e.g. keystroke or button pushed) the resultant output is always the same. Application software is very much like your conscious mind where you do your work, your rational thought, your analyzing, computation, language, and planning. This is the part of your mind that is responsible for decision making, for setting intention about what you want, and what you will do. Your conscious mind believes it is in control and is exercising free will when it makes decisions and directs your daily activity. Your conscious mind is where you exert your willpower. Underneath the application software there is always an operating system in every computer (or smart phone). Some of the common operating systems are Windows, Unix, IOS, Android, Linux. The operating system’s purpose is to do everything so that you can do your work (your specific application), whatever it is, on the computer successfully. The primary tasks of the operating system are to make everything work together smoothly, to handle the many detail tasks necessary to make the computer operate, and to stay mostly hidden in the background. Some of the tasks managed by the operating system include holding the images of windows in memory and displaying the currently chosen window on top, checking all incoming messages on the communication line, storing those addressed to you and forwarding the others to the next node on the communication link, scanning all activity for viruses, writing data to disk in available space, and stringing together documents retrieved from multiple storage fragments, and enforcing security. Even when the computer seems idle, there are dozens of programs running in the operating system carrying on necessary tasks and staying prepared for action. You have an operating system, too. It’s your sub-conscious mind. It runs your body, your reactions, your emotions, your skills, and your habits. When you sleep your conscious mind is off-line and your sub-conscious mind runs your dreams and continues to run your body as it does during the day. Your operating system operates automatically, utilizing the thousands of programs that have been stored there from your lifetime of experiences. Some say your sub-conscious is in your heart, but others say it is is distributed into every cell of your body. A recent realization that there is a small brain in the gut that controls the immune system highlights the complexity of our mind-body connection. Finally, electricity (energy) powers a computer either as alternating current directly, or stored as chemical energy from a battery. The Internet provides connectivity to other people and worldwide resources. What powers the human that is you? It is called your super-conscious, or some call it your Spirit or soul. It is what powers each of us, no matter what our belief system. It gives you your life force, connecting you to all other life in the universe and to the divine. It is our combination of powerful energy (like electricity) and universal communication and access to resources (like the internet) on a spiritual plane. 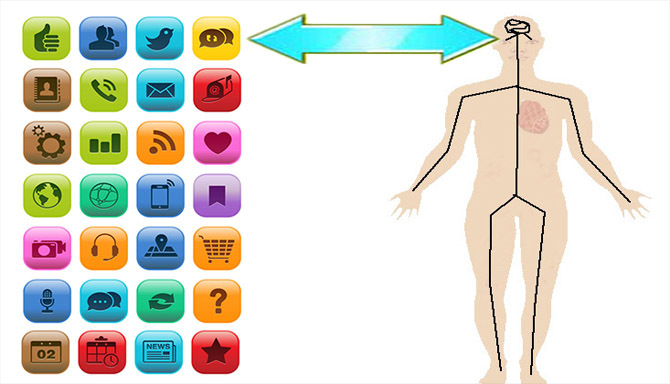 Your body affects your mind and your mind affects your body, but the overall design is for the mind to have the controlling effect just as in a computer the software dominates the hardware. Your mind connect to your super-conscious, the infinite resource of creativity and energy. 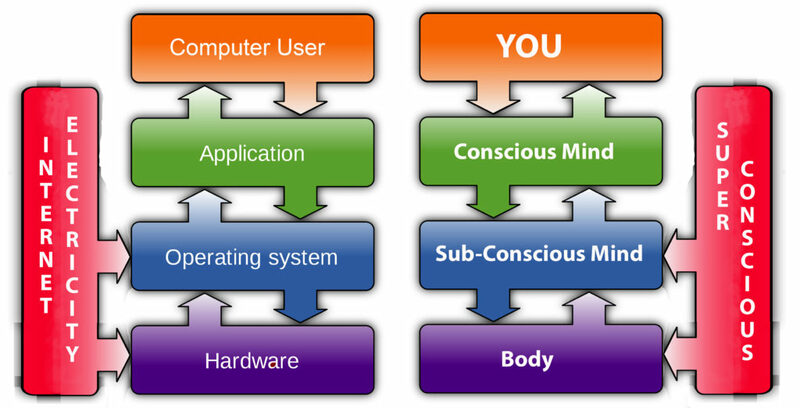 The computer model has other similarities to the mind-body connection. 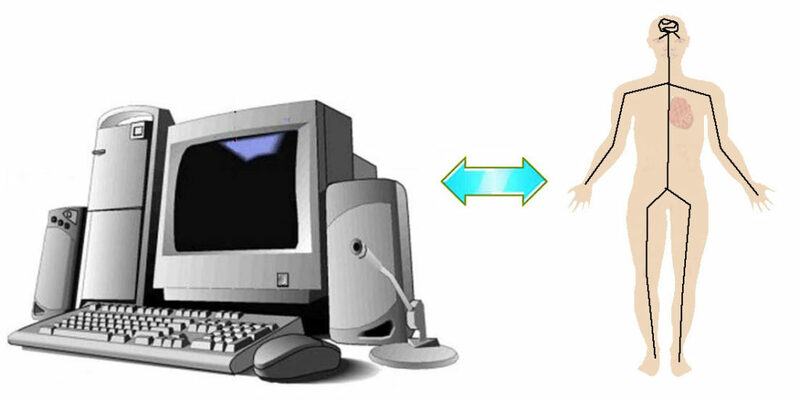 The operating system of a computer always processes upgrades when the computer is first powered on or as it is shutting off. The reason for this timing is to prevent interference from the application programs which must be inoperative during the updates. Updates to your operating system, your sub-conscious, are most easily made when you are shutting down for sleep or first coming back to fully awake. This is for the same reason, to avoid interference from your application software, your conscious mind. Since your conscious mind shuts down during sleep, while your sub-conscious continues to run your body and your dreams, it doesn’t interfere with reprogramming instructions given to your sub-conscious as you fall asleep or first awaken. The computer model for your mind-body connection is a powerful tool for you to consider how you want to reprogram yourself to achieve the adjustments in your life that you desire. Because you are in control of your thoughts, you are in control of the mind-body connection programs that affect your health and your habits. If you need assistance in learning how to do that, we can help. In person, via phone or Skype. 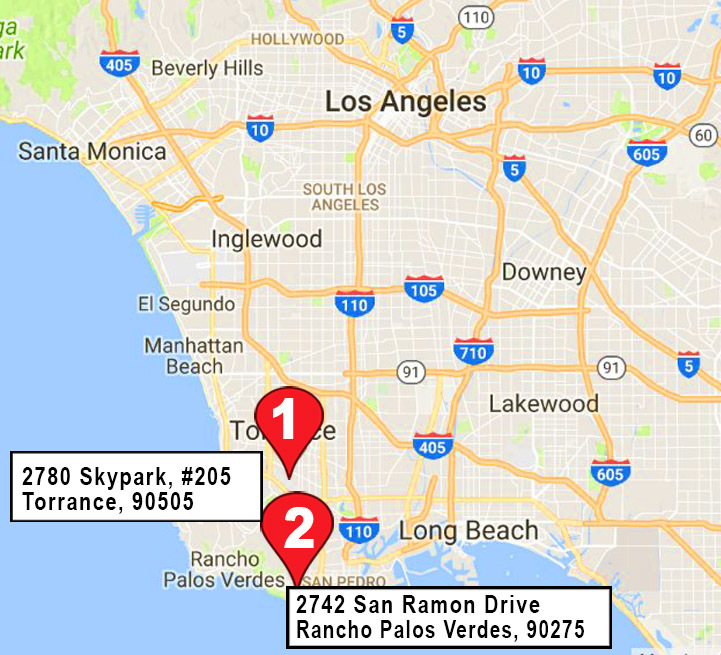 Appointments available at Skypark Office in Torrance on Tuesday and Thursday afternoons and in Pasadena area office in San Marino on Mondays. Hypnosis is a professional complimentary & alternative health & wellness modality and not a state-licensed healing art.